Creative arts, intown housing and solid industry. Anyone who has visited Thomasville leaves knowing that there’s something different going on there. It’s taken more than three decades of hard work and tough decision-making to bring the county, and namely Thomasville, to where it is today – the shining example of how small-town downtowns can not only survive but thrive. In the 1970s, as urban sprawl began to inch its way into even the most rural corners of Georgia and shopping malls and big-box stores began luring customers away from the mom-and-pop shops of Thomasville’s cobbled streets, a handful of community leaders and business owners dug in their heels, refusing to allow the changes to shutter their downtown. Some 30 years later, downtown Thomasville has become what all small-town downtowns wish to be: thriving, growing and attracting patrons both day and night. Designated a Main Street City in 1981 – one of the first in the nation – Thomasville has since spent more than $85.7 million in public-private improvements in its downtown district and today boasts a winning combination of retail, service and dining opportunities, along with a long list of arts and cultural activities, many of which are free to the public. While downtown leaders realize much of the money being spent there comes from out-of-town visitors, they also recognize the support of locals and the visionary entrepreneurs who continue to take chances and succeed in Thomas County. In 2015, 10 new downtown businesses opened, creating 51 new jobs, says Karen Smith, executive director of Main Street and Tourism. Smith, who’s served a total of 25 years with the city, says living closer to downtown will soon be easier thanks to the creation of Victoria Place, a new urban redevelopment area. The Homes of Victoria Park, in a downtown neighborhood rich in history, now has 30 available lots. Last year, the Georgia Initiative for Community Housing program recognized Thomasville for the $4.1-million project’s con tributions to affordable housing and community revitalization. “Our hope is that the neighborhood will really make a comeback with a mixture of young families and older residents and become another neighborhood with-in walking distance of our downtown,” she says. Current focus is on two additional downtown projects – an event center in a defunct discount store space and an amphitheater in the newly dubbed Creative District. A partnership between downtown leaders and the Thomasville Center for the Arts produced a plan for revitalizing what years ago was known as “The Bottom,” a formerly struggling district adjacent to the busier downtown blocks. The Creative District is already coming to life and includes a number of businesses, a designated space for arts programming and the new amphitheater. The district will also include a trailhead for a new multi-use trail system connecting historic districts, parks and commerce centers. 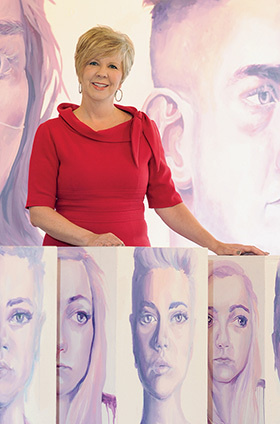 Michelle Arwood, executive director of Thomasville Center for the Arts, is working to leverage the arts to affect economic development over the long term by offering more educational programming downtown and exposing kids to art. “We know those things make for a better workforce,” she says. The center’s annual event, FLAUNT, a month-long public art exhibition in the Creative District, last year prompted the permanent location there of five or six new businesses that operated along Jackson Street as pop-up shops during FLAUNT. Outside the back doors of businesses along Jackson is the new amphitheater and the center’s Studio 209, an exhibit and art education space in on old Coca-Cola bottling plant, says Arwood. Only five spaces remain available in the entire district. Newcomers have proven eager to join the service-oriented businesses that have operated in that district for years, including a drycleaners, a shoe repair shop and hair salons. “All of a sudden [the Creative District] is blossoming, and that’s the place everyone wants to be,” she says, naming new businesses such as Fuzzy Goat, a yarn shop and provider of knitting classes; Homme Haberdashery, which bills itself as a “sub-urban” men’s store; and Bacchus Wine Bar. Matt Delarber, owner of Bacchus, helped blaze the trail in the Creative District, says Smith. Delarber moved his family from Orlando about 11 years ago and purchased three buildings on downtown’s Jackson Street, he says, one for an office and two he’d hoped to lease to others. When that didn’t happen, he opted to open the wine bar there instead. “I had the business model for about 15 years before I opened it,” he says, noting that the Creative District, as such, didn’t exist when he first bought into the community. Now in its fourth year, business at Bacchus is good and Delarber recently expanded hours to include lunch service. While much of the clientele during the week is local, weekends are especially heavy with patrons from outside Thomas County, primarily Tallahassee. “For North Tallahassee residents especially, it’s actually easier and more convenient to get into Thomasville than it is to get into downtown Tallahassee,” he says. While the list of Thomas County newcomers is long, there also exists an impressive list of corporations that have called the area home for decades, a century even. In 1919, brothers William and Joseph Flowers opened Flowers Baking Co. in Thomasville, producing 30,000 loaves a day on the latest equipment. Nearly 100 years later, Flowers Foods is one of Thomas County’s largest employers and is one of the largest producers of packaged bakery foods in the United States. They now operate more than 40 bakeries across the country and produce bread lines such as Sunbeam, Cobblestone Mill and Nature’s Own as well as tortillas, rolls and snack cakes. Thomasville is also home to corporate headquarters for boiler manufacturers Cleaver-Brooks and Hurst Boilers as well as Ag-Pro Companies and Turbine Engine Components Technologies. Family-owned Ag-Pro, in Boston, Ga., owns John Deere dealerships throughout the country. In 2015, they moved their corporate headquarters to Thomas County, investing $7 million to construct an office building and add 60 jobs. Also in 2015, boiler manufacturer Cleaver-Brooks added 67 new jobs and expanded its manufacturing and office facilities, and Hurst invested $4 million, adding 55,000 square feet and 50 jobs. In addition, about 210 retail and service industry jobs were added during 2015, says Zorn. On a smaller level, Blackberry Patch, a producer of small-batch jams and jellies, expanded its facility and added 10 jobs. They gained notoriety in 2014 when Oprah Winfrey included its fruit syrups in Oprah’s Favorite Things, her holiday gift guide published in O magazine. The longevity of these industries and others is due in part, she believes, to the county’s practice of offering the same incentives to expanding existing industries as it does to new industries. In fact, it’s the presence of Hurst Boiler & Welding in nearby Coolidge that attracted newcomer Oilon, a Finnish company that manufactures burners used in boilers. They’ve established their North and Central American headquarters in Thomasville and are preparing to move into a permanent 33,000-square-foot building. In 2014, Oilon made the decision to establish its first and only North American manufacturing facility in Thomasville, making a total investment of about $2 million with a target of employing 50, says Johan Tallberg, CEO of Oilon’s North and Central America operations. The company has 300 employees worldwide, but choosing where to locate the new operation was an easy decision, he says. “Industrial boilers have been made [in Thomas County] for 50 or 60 years. When people say they work for a boiler or burner company, it’s respected; it’s a solid industry,” he says. Though they’ve been exporting their products to the U.S. for 25 years, Hurst Boilers was their first buyer in the country. Other stateside customers include International Paper, Georgia-Pacific and Kimberly-Clark. The creation of sustainable jobs for Thomasville residents is No. 1 on the to-do list of newly elected Mayor Greg Hobbs. With city-owned utilities, including high-speed broadband Internet, Thomasville should be a draw for telecommunications companies and other businesses that require that technology, he says, providing a win-win for residents and new businesses. A general contractor for 23 years, Hobbs has served on the city council since 2009 and as mayor pro tem for the past four years. One of the city’s challenges is getting residents involved in the planning process from the beginning rather than waiting to voice disapproval after all the decisions have been made. In addition to business and industry, Thomas County is also home to 71 privately owned hunting plantations, bringing guests from around the world to enjoy the traditional quail hunting experience. The local economic impact of quail hunting properties in Thomas County is $67.8 million, including $23.6 million in labor income from 654 jobs, according to Neil Fleckenstein, a planning coordinator who managed a study conducted by Tall Timbers Research Station and Land Conservancy. All told, about 46 percent of the overall $147 million regional economic impact is attributable to properties in Thomas County, he adds. While furthering relationships with about 100 existing industries in Thomas County is a priority for Zorn, bringing new industry to town is key to continued success. When she took the position two years ago, her directives were to draft a strategic plan and to spend about half her time working with existing industry and the other half working to bring in new industry. “I think it’s really unique to have a community that sees the value of existing industry. You can grow the jobs faster with something you already have,” she says. These days she’s on the hunt for industries to occupy the new 293-acre Red Hills Business Park set to open this year. It’s the result of a long-term collaboration between the city and the county development authority. Also keeping her busy is marketing Southwestern Campus, which was home to the state mental hospital until it closed in 2013. It’s a beautiful 208-acre property with ponds and trees that looks more like a college campus than a hospital. The 400,000 square feet of buildings include a main facility with an indoor bowling alley, a cafeteria, basketball court and auditorium. “It could be an awesome corporate headquarters or retirement living or college campus. It has a lot of potential to be something,” she says. Fostering that entrepreneurial growth is part of a five-year strategic plan that directs Zorn’s efforts as well as those of Lauren Basford, executive director of the Thomasville-Thomas County Chamber of Commerce. “There’s been kind of a new energy with new ideas and new focus when it comes to promoting entrepreneurship,” says Basford. “Thomasville tends to be a bit of an anomaly – creative, progressive and with a heavy focus on the arts. We see it happening organically and decided to take the idea and try to expand on it. City Council member Max Beverly says that while the success has been phenomenal, challenges – such as limited parking – still exist, and now is not the time to sit back and relish the success. As young people across the country make a mass exodus from small towns, he says, Thomasville hopes to retain young families. So far, it’s working. Superhero Status: One downtown Thomasville entrepreneur has transformed himself to superhero status. Scott Chastain, a landscape architect by training, felt his heart nudging him in a different career direction. In 2010, Chastain launched Everfan, initially offering capes with collegiate logos and whimsical designs. Soon custom cape orders for marketing promotions, fundraisers, even conventions helped Everfan turn a corner. Its biggest order to date – 9,250 capes – came from Chick-fil-A last year. While Chastain’s capes are sold around the world, it’s working with children’s hospitals and organizations such as Court Appointed Special Advocates (CASA) – volunteer advocates for abused and neglected children – that really stokes his inner hero. Heart Heroes, an international nonprofit, sends capes around the world to children undergoing heart surgery. And Everfan recently crafted special shirts for kids to wear while undergoing MRIs at New York-Presbyterian Hospital. After the scan, an Everfan cape attaches to the shoulders via Velcro tabs, and the patient becomes a celebrated superhero.